Everything went right for SAINT ANYTHING until chapter 8. Everything was going right. Plot was going well, characters were developing, romance was starting steady, curiosity was all there, writing was classic as usual. Pacing was pitch-perfect. Then everything changed when the Fire Nation attacked (I had to). Honestly, I haven’t been the biggest fan of Sarah Dessen. The traditional contemporary just doesn’t work for me, and it’s like that across the board. 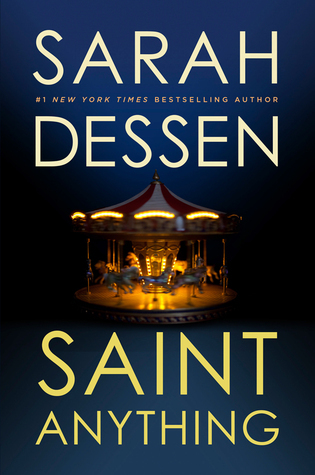 However, SAINT ANYTHING is really different from Dessen’s other works and while a lot of fans were disappointed, I thought her style in this story was really refreshing. When things started going wrong around the middle, I realized it first with the plot. Dessen sets up a lot of different subplots within the beginning, and she executed it perfectly, but things fell through in the middle. There was too much focus on things that didn’t really matter, and a few of the subplots suffered to the point where the ending felt really rushed. Then the romance kind of came out of nowhere. Sure, Mac is through and through a Dessen boy. Nothing too special there. Sure, Sydney thinks from the beginning that he’s cute, but it goes from that to a subtle friendship to romance too quickly. It wasn’t believable for me. As for other supporting characters, I came to really like the attention on some of Peyton’s other friends, and there was some great scenes, but the sudden lack of attention to them made the story fall through for me. When it came to themes, SAINT ANYTHING is probably my favorite book out of all of Dessen’s works, but in the end it didn’t work out as well. I did think some great themes about parent/child trust, the prison system and guilt come out in this story, but I wanted more from this book, as well as more from Peyton and his side of the story. Overall, SAINT ANYTHING was both a surprise and a disappointment. I got my hopes up in the beginning, and throughout the book Dessen lives up to her reputation with certain passages, but other than that things slowly got worse. I would recommend this for fans of Dessen’s other books, because it is worth a shot, but for people who haven’t tried Sarah Dessen’s works, I would recommend some of her other books (Along for the Ride, Just Listen, The Truth About Forever). 2.5 stars. Liars, Inc. Black Friday Sale!